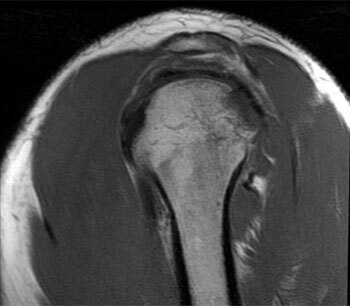 An image from the MRI of my shoulder that was taken on Wednesday. I can't read these things, but I thought this particular image looked neat. As I posted earlier this month, on Feb. 3 while scrimmaging with the Western Plains High School Bobcat Boys basketball team, I got hurt. I dislocated my shoulder. It was my left shoulder. A shoulder I had surgery on twice when I was in high school due to frequent dislocations caused by football but hadn’t had any problems with for nearly five years. This time, unlike the previous dislocations, it slipped out of the joint downward instead of popping up and sitting on top of the joint. Wednesday I had an MRI to determine the extent of the damage. The results came to me late Friday, and they weren’t positive. When the doctor from Ransom’s McClain Medical Clinic called, he asked how my shoulder felt. I told him it didn’t feel too good, and he said he could see why. I knew bad news was forthcoming at that point. He prattled off a few things about my shoulder, specifically there was a lot of fluid built up. Most of it didn’t really sink in until I saw the MRI report myself. I Googled Hill-Sachs defect and found it is “a compression fracture in the top of the humerus, caused by the head of the humerus impacting the glenoid when the dislocation occurs,” according to Shoulder1.com. Super. My shoulder is literally broken. According to Sports Injury Info, “A Bankart lesion is a specific type of shoulder labral tear. It is extremely common with shoulder dislocations, and often contributes to shoulder instability.” The report said it’s “not appreciated,” but I take that as meaning it is still a possibility since it didn’t say “not present” or something of that nature. So there’s fluid. I don’t know what that means exactly in regards to my injury, but it probably isn’t good. From this I infer that everything is tore up, especially when there are other mentions of tears and such in the findings report. The report went on from there, and at the end it had “impressions” from what was seen, all of which referred to the fracture and tears that I talked about previously. To me, it seems that my shoulder is pretty messed up. Perhaps the first two surgeries didn’t quite fix it. I don’t know. I will be seeing a specialist in the coming days to decide what the next course of action is. I am almost certain surgery is in my future. The question that is nagging at me is, what kind of surgery will it be? The previous two attempts didn’t work apparently, so now where do we go? How really messed up is it in there? Am I going to have to have a shoulder replacement? Just don’t know. Now as you read that I guess you might be confused by the shoulder replacement possibility, and though I didn’t know if it was a doable thing, I found that it is. According to the American Academy of Orthopaedic Surgeons, such surgeries have been performed in the United States since the 1950s. “The usual total shoulder replacement involves replacing the arthritic joint surfaces with a highly polished metal ball attached to a stem, and a plastic socket,” the site said. Or there is another option, called a reverse total shoulder replacement. It was approved for use in the United States in 2004. “In reverse total shoulder replacement, the socket and metal ball are switched. That means a metal ball is attached to the shoulder bone and a plastic socket is attached to the upper arm bone. This allows the patient to use the deltoid muscle instead of the torn rotator cuff to lift the arm,” the site said. So will this be the course of action I am forced to take? I don’t know. I’m not a doctor. I’m just spit-balling here. See, I have a gut feeling this surgery is probably going to have to be the most invasive I have ever had, and I am trying to prepare myself for the most intense result I can, which I figure short of having the arm cut off is having a shoulder replacement. I guess only time will tell, though. When I finally get to meet with this specialist, I will report the determination that doctor makes. I’m crossing my fingers for the best but trying to mentally prepare myself for the worst.